With their latest announcement, Whole Foods Market shows it’s still a brand that stays in touch with its customers’ desires. After compiling results from a group of Whole Foods buyers and experts, including doctors and sommeliers, Whole Foods has discovered what foods need to be stocked in its stores in 2018. Some of the items on the list of anticipated food trends may surprise you. For instance, Whole Foods expects flowers and roots and stems to be incorporated into 2018 shoppers’ diets, as well as mushrooms and powders. Lavender, elderflower, watermelon rinds, broccoli stems, and turmeric powder are projected to be used in recipes ranging from coffees and teas to main dishes. In addition, dishes that incorporate science to advance recipes and manipulate plant-based ingredients have been added. One example includes plant-based milks — banana, pea, and macadamia nut varieties, which will likely appeal to consumers in 2018. Other food trends will include popped and dried snacks, including parsnip and Brussel sprout crisps, as well as Middle Eastern cuisine and flavored sparkling water. 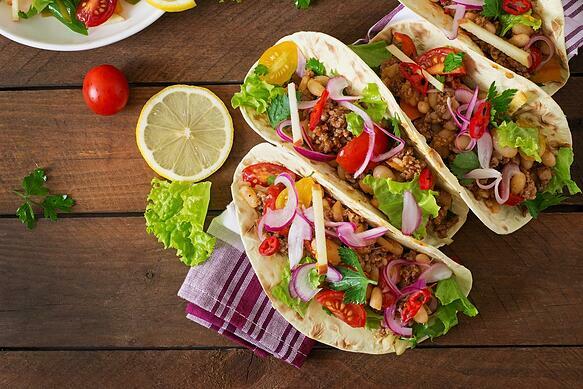 The appeal of tacos — almost acting as its own food group — will continue to be a foodie favorite although Whole Food experts look for nontraditional ingredients and presentation of tacos in 2018. Read more here.